We remove asbestos free acoustic by covering your furnishings and floor with two layers of plastic and covering your walls with another layer of plastic completely protecting the interior of your home. Ceiling fixtures are then removed so if they are ever changed no acoustic will be there. Your ceiling is then moistened and removed. Any bad Sheetrock and joint tape is replaced. All joints and nails are coated with joint compound to achieve as smooth a surface as possible. New wall texture is applied and knocked down. 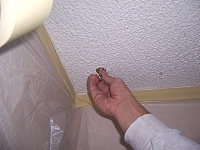 Your ceiling is then finished with two coats of paint if desired. Plastic is then removed and taken away. Click here to see step by step photos of the process. We offer all types of machine and hand applied wall textures. There is nothing that can so drastically change and update the look of a home as retexturing the walls and ceilings. We prepare your walls for texture by filling all holes, taping all cracks and covering anything that does not get textured. Cost of this service varies from job to job. In Addition to installation, taping and texturing new drywall Super Shooters offers all types of sheetrock repair and patching including water and smoke damage. We also overlay old lath and plaster walls and ceilings with sheetrock, tape and texture. In many cases this is the only way to permanently cure sagging and cracking plaster. Cost of this service varies from job to job. All work is guaranteed to be free from defects in material and workmanship for as long as you own your home. We offer a complete service with over 30 years of satisfied customers. If service is found defective, it will be repaired at no cost to you. Your new ceiling / wall texture is guaranteed not to flake, peel or crack unless caused by house settling, water damage or failure of substrate. Should your texture crack due to settling it will be repaired for you once at no cost during the first year.